President Donald Trump delivered his biggest speech yet when he addressed the US Congress a few days ago and he did it for the first time as President of the United States. However, it appears that his speech was a tiny bit overshadowed by the way the Congress greeted the First Lady, Melania Trump. Trump’s beautiful and radiant wife Melania looked stunning in her a stylish black suit when she received a thundering applause and standing ovation the moment president Trump noted her presence in the packed audience. Judi James, body language expert at Mirror, gave her two cents on the whole situation and her feelings are rather ambivalent. 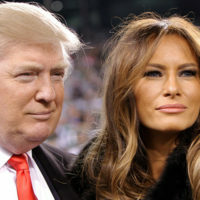 According to James, Melania’s appearance at Congress can actually be an omen of the next Lady Di scenario, meaning the First Lady could actually outshine and overshadow her husband on world’s political scene, despite trying to stay away from the spotlight. However, the body language expert also noticed that Melania’s posture yet again suggested that she’s feeling anxious and pretty much alone. “The First Lady’s body language finally defined her role in congress yesterday and it’s a rather a sadly ironic one: Melania is the show-stopper who looks terrified of stopping the show. The show is, of course, her husband’s and he’s not a man with a love of being upstaged,” says Judi. Judy points out that Melania’s subtle facial expressions talk more than her words. When Trump gave his wife an Oscar-style mention and the audience gave her yet another ovation, one could see that her whole body was overtaken by anxiety. However, Judy still claims that Melania might, sooner rather than later, find herself getting “thrown into the spotlight to a point where she throws her alpha male hubby into the shade,” much like Princess Diana did.